I was recently in Vancouver, Canada, to participate in a convention called “Missions Fest.” Over three days thousands of people gather at one of the city’s largest venues to hear speakers on a variety of biblical topics. My ministry was one of over two hundred which had displays, small and large. Weeks before the event, I was discussing with one of my daughters what I might do to encourage people to interact with my display. 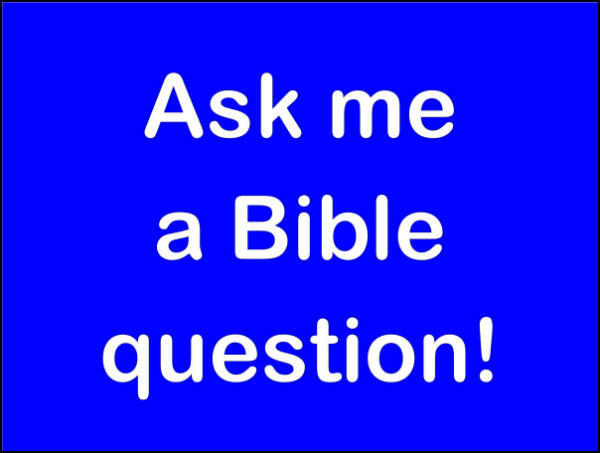 She suggested I make a simple sign with the words, “Ask me a Bible question!” on it. This led to some very interesting discussions. One interaction didn’t go so well, because in the name of asking me a question, the person chose to harshly lecture me on the Sabbath. In the end, they questioned my eternal future with God because I wouldn’t fully subscribe to their perspective, which is too bad, since this is a very important, and often neglected, issue. So, as briefly as I can I will share what I believe to be a sound biblical perspective on the Sabbath. First, however we might derive universal moral principles from the Ten Commandments (of which the Sabbath command is a part), it is primarily a cornerstone of the covenant given by God to the people of Israel through Moses at Mt. Sinai. As the special ten, they represented the whole of the covenant, which includes many other directives covering every aspect of Israelite society. This is why the tablets of the Ten Commandments were to be included in the Ark of the Covenant, stored in the Most Holy Place within the Tabernacle and later the Temple. Unlike the earlier covenant God made with Israel through Abraham, Isaac, and Jacob, which was unconditional and eternal, the Sinai Covenant through Moses was conditional and temporary. As a covenant, it was broken by the people of Israel by their turning to other gods over and over again. God’s response to the breaking of the Sinai Covenant was the New Covenant promised through the prophet Jeremiah (see Jeremiah 31:31-33) and instituted by the Messiah (see Luke 22:20). The New Covenant internalizes much of the essence of the Sinai Covenant and permanently establishes right relationship with God. And so, as a system of law, the Sinai Covenant is no longer in effect. Therefore, the Ten Commandments as representative of the Sinai covenant aren’t binding. This doesn’t imply that the principles they represent are to be neglected necessarily, since biblically speaking they, like so many of the other directives contained in the Sinai Covenant, are clearly eternal, universal principles. Application of the Sabbath beyond the confines of ancient Israel, however, isn’t straightforward. As the early followers of Yeshua began to teach God’s Truth to non-Jews, while they taught principles based on Old Covenant Scripture, including the Ten Commandments, they warned against the imposition of Sabbath law (e.g. Galatians 2:16; Colossians 4:10). Why is that? Unlike the other nine and many other directives revealed by God through Moses, Sabbath keeping includes more than the moral and spiritual components of other commands. By regulating the work-week, Sabbath also addresses general society. Not only would it be impossible for people outside the Jewish world to effectively observe Sabbath by demanding the cessation of work, it would cause an unnecessary clash with the pagan world of that day. Does that mean, therefore, that Sabbath has no place whatsoever among Yeshua’s followers? For much of history Sabbath has been most central to the lives of believers. It is thought that the Sabbath was changed from the seventh day (Saturday) to the first (Sunday), due to Yeshua’s resurrection and the early believers meeting on that day. Actually, there is very little evidence of what really occurred and why. Nevertheless, believing communities for most of the past two thousand years have almost always determined that some sort of Sabbath keeping was to be implemented. They were right to do so, because even though Sabbath keeping was not to be imposed upon believers from among the nations, it is clearly an important principle of Scripture stemming back prior to the giving of the Sinai Covenant. While the Sabbath as expressed in the Ten Commandments is specific to Israel under the Sinai Covenant, it is not only rooted in creation (Bereshit/Genesis 2:1-3), it reveals God’s perspective on the need for rest, not only for self, but for those under our care, including even animals. Why, therefore, would we not seek to implement a principle that so obviously expresses God’s understanding of life, work, and rest? By not imposing their particular implementation of Sabbath the early Jewish believers gave non-Jewish communities the opportunity to develop culturally appropriate expressions of Sabbath over time, which is exactly what they did do, that is until more recently when it is just about forgotten altogether. While we are not mandated to impose Sabbath keeping upon one another, we would be well advised to seek God and the Scriptures for appropriate application of the Sabbath within our communities today. This includes speaking into the society at large, encouraging civil governments to return to the kind of godly rhythm of rest exemplified by the Creator himself. The Sabbath is from Sun down Friday til dun down Saturday. Response to David Collins: Yes, that is absolutely true. But with all due respect to people’s convictions, in my opinion, it is difficult to establish a strong biblical case that insists upon seventh-day observance for all believers everywhere (as I sought to explain in the above message). I would agree that keeping *a* sabbath on any day but the seventh, is not the same as “keeping *the* Sabbath.” At the same time it appears that God allows for that freedom.